What do you do when a long awaited Himalayan trekking trip turns into a nightmare? 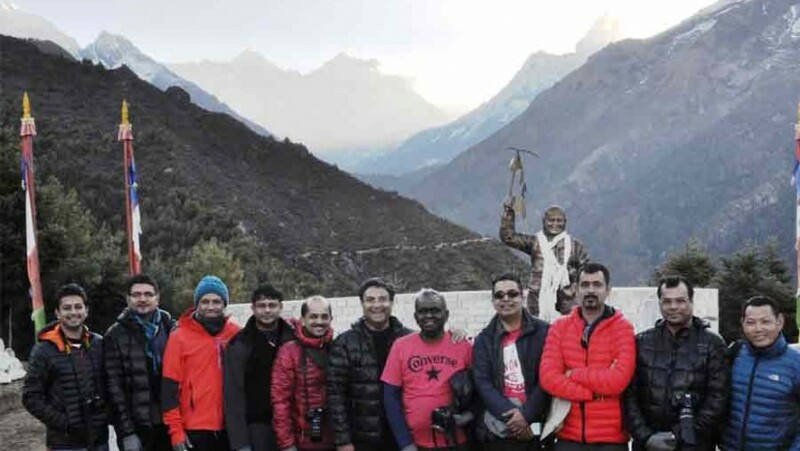 Read on to know how a group of trekkers who had set out to conquer the Kongde mountain ranges in the Khumbu region of the Himalayas, react when the earth below their feet swaggered and the mountain did a jig (in their own words). They were on their way up to Sumdur Peak, at a height of 15,000 feet in the Everest region when the massive quake hit on April 25, 2015. We spoke to two members of this group—Narendran Koduvattat, co-founder and managing director, LIGA Edutech Pvt. Ltd., and Bhaskar Chicknanjundappa, director, I-Point Consulting Pvt. Ltd. about their experience. Here’s what they had to share! What was the intended trekking route? Bhaskar: Our journey was from Mangalore to Kathmandu to Lukla in Nepal by flight. The trek route was to be Lukla–Monjo–Namche–Thame–Kongde–Phakding–Lukla over eight days. Naren: The intention was to walk on top of the world but not get stuck along the crowded Everest base camp routes. Lukla is accessible only by air and the trek from there to Monjo is approximately 12 kms. After an overnight stop at Monjo we trekked about 6 km to Namche. The third day was spent undertaking acclimatization walks and visiting Everest viewpoints travelling up to Khumjung and back (about 12 km). After spending the night at Namche, we proceeded to Thame (around 10 km) on the fourth day. After acclimatization walks, we were climbing Sumdur Peak on the fifth day when the quake struck. What kind of planning did you do before the trip? Bhaskar: There were 10 of us in different shapes and sizes! A few amongst us did some very good research on what such a trek entails—weather, clothes, fitness, money required, people in the locality— and shared the information with the entire group. We also got a health check up to get a sign off from our doctors and bought medications suggested by them for high altitude sickness. We were also advised to get into a routine of exercising—especially walking and climbing with the big shoes, at least two months in advance. We had to pack our bags such that we have warm clothing suitable for temperatures from 5°C to a little under 0°C. But, at the same time, we had to travel light to make it easy to transport it all—to be easy on us, the tour co-ordinators, and the porters! Naren: We had planned for every step of the trip. A lot of effort went into choosing the accommodation and guides, fixing the itinerary (it was very complex with many of us coming in from different cities), studying the climate patterns, reading travelogues, physical fitness preparations, doing health check ups, finalizing insurance plans, finalizing the kit, purchasing things, dividing the load … it’s a long list! Did you research on the destination & facilities available? Naren: Our group has been trekking and exploring for almost 15 years and all of us really wanted to trek in the Himalayas. We were all game for roughing it out but didn’t really fancy tents and open camping. We wanted the comforts of a cooked meal, warm bed, and running water after a tiring day. We also wanted a couple of really adventurous trails in our trek. After much research, we decided to go to the Khumbu region but not towards Everest base camp. Bhaskar: Our group had pretty decent knowledge about trekking but it was nowhere close what we were getting into. So, we looked up a lot of good information on the internet to get a feel of the place. We spoke to our tour organizers Yeti Mountain Homes (YMH) a lot. Their tour organizer was absolutely brilliant in giving all necessary inputs and being very patient with our plethora of questions and changing requirements. Did you take out travel insurance before embarking on your journey? Did this turn out to be a good decision? Naren: Yes we did. It covered medical expenses and medical emergencies but not natural calamities and definitely nothing like an earthquake measuring 7.8 on the Richter scale. So, it didn’t really help us during the crisis which unfolded during our trip. But, travel insurance with emergency evacuations is strongly recommended, if not a must. Bhaskar: We had travel insurance which would cover us for personal accidents, illnesses, hospitalization, and emergency evacuation due to such illness. Having insurance in itself is a good thing, but with the disaster we encountered it was not of any help in covering those aspects. Did the tour operator have a disaster management plan in place? Naren: I guess they had. But not for the kind of disaster we faced. The last 3-4 generations of Nepalese hadn’t experienced such a rattler and it showed everywhere. There were no warnings either. But the tour operator responded to the situation admirably. They went out of their way to stay in touch and get us to safety. The guides were just too fabulous. The lead guide ignored his own safety and didn’t even bother about his family, staying on with us till we left. Most of us and him wept unabashedly during goodbyes. Even after reaching home, our group helped him with rescue and restoration efforts at his village. I am still in touch with him. Bhaskar: Whether they had a disaster recovery plan or not, I would like to highlight and emphasize the fact that we would not have been here today almost unscathed, but for YMH! For such disasters and in such places, I am not sure any disaster preparedness would be of help, other than having excellent relationships with various authorities, connect with local community, communication mediums, and good communication skills. Simply put they had most of it and we were just about lucky! How did the hotel/resort staff handle the situation? Were they prepared for such natural calamities? Naren: On that fateful day, we were at Thame, a tiny village by the side of the Dudh Koshi River. Thame has maybe 30 structures including houses, a school, shops, and a couple of tourist lodges. Ours was the least damaged structure. We were very lucky that rooms, kitchen, and stores were intact. Also, power and water supply was not affected. We also had the telephone landline intact. Many villagers and other tourists gathered at our lodge. The lodge was prepared for the usual challenges. For example, they had a good medical emergency kit, extra warm clothing, surplus stock of food and fuel, and their staff has been trained well. But they were definitely not “prepared” for an earthquake of this magnitude! Still, they did their best with first priority being given to their guests. They also offered shelter, blankets, and basic food to others. They kept in constant touch with their HQ and arranged the first possible rescue mission for us. Bhaskar: In terms of preparedness for such disasters….honestly there is only so much you can be prepared for! I thought they were tough people who withstood the odds and instilled confidence in others. Under the circumstances, they did an outstanding job managing the inflow of people, shortage of food, helping to connect to our dear ones back home, and providing any help possible to get us out from Thame to a safer place. But the irony in this situation was, which was a safe place?? What do you have to say about the entire experience? Your understanding/learning from this trip? Naren: The earthquake struck while we were climbing Sumdur Peak. We had just finished 15,000 ft when the mountain swayed sideways (yes, contrary to popular notion, it was not just a jerk, the earth swaggered, the mountain actually did a jig). It was accompanied by a howling noise and then there was the deafening sound of landslides. All of this was happening under heavy snowfall with visibility of less than 15 ft. Initially, each of us thought it was giddiness. But when all of us lost balance and hit the ground, the truth struck us. I still remember the faces of our guides—they were shell-shocked, frozen! And that look told me we were facing something deadlier than what we had ever prepared for. It was surreal! It was the experience of a lifetime. On one hand, we experienced the Himalayas in all their splendour and mysterious charms; we were pushed to physical limits but there was almost a serene spirituality about the entire episode. On the other hand, we saw a raging planet leaving destruction and death all around. Personally, the Himalayan trekking trip showed me both the beauty and the power of Mother Nature and reinforced my belief never to take it lightly. It also showed me human nature in a crisis—mostly heroic, some dark, some even comic—unforgettable! Bhaskar: The people skills and humanitarian attitude of our guide, his assistants, as well as our YMH tour organizer was an eye-opener. Despite the language barriers, they put us ahead of everything else to ensure we return home safe and sound. Our chief guide would not leave Kathmandu airport until we were safely with the IAF personnel! For me, the experience was a lesson on how to be patient in trying circumstances when dealing with a group of very disturbed and differently-oriented people. My respect and admiration for the Indian Armed Forces has reached new heights having seen and experienced firsthand their grit and determination in the face of adversity. Take the instance of the Wing Commander who helped us and then gave the number of his wife in Nagpur and asked us to pass on the message that he is fine and will be back in a week. He said that she was a little tense as they were expecting their first baby in 10 days. We spoke to her and thanked her to which she said, “It is his duty and I am glad he was of help to all of you and many others.” We asked her if she spoke to him and she said, “When on duty, he does not call”. Another touching moment was when I saw the coffins of two countrymen who died in the quake being brought home in the same IAF plane as us. Destiny shapes itself without warning; we could have just as well been in those boxes! Any tips you would like to share with our readers who might find themselves in similar circumstances? Naren: Have a great team committed to the trek. You just can’t afford someone with half-a-mind being a part of the team. Whether your trek goes off smoothly or is enveloped by calamity, the chemistry between people is what creates the strongest memories. Always have a Plan-B for each leg. All plans must factor in some team members getting injured or falling ill.
Be fully aware of rescue possibilities and constraints at each point of the trail. Know your terrain thoroughly and prepare physically as well as mentally for it. Discuss the entire plan as well as worst-case scenarios among the entire team. Ensure each person (and their dear ones) is aware of the risks. Create a base station back home with a couple of close friends continuously in touch with you. We had done this and it helped us to no end. The base camp ran our rescue and kept the world updated about us. Bhaskar: Stay calm, form a decision-making group, share your inputs, follow the directions of the group, build rapport with all segments of people, admire and respect nature. Nature can be disastrous, but that should not stop us from respecting her and better preparing for uncertainties in life! You will get a lot of help and a lot inputs and advice from all quarters. Listen to all of it, analyze with a cool head, and decide on what to use and what to discard. Given a similar opportunity in future, would you take it up? What would you do different next time around? Naren: In fact, we couldn’t finish the Thame-Kongde leg, which was supposed to be the highlight of our trek. I had dreamt of sitting outside the Kongde Lodge watching the entire Everest range and glaciers over clear skies. It is supposed to be an unbelievable place. That means we have an unfinished agenda. Some of us are already planning to get back—if all goes well—in October 2016. Bhaskar: Physically I feel I am good to go, but the mental fatigue, it is going to be a challenge! Specifically, what the family back here had to go through for those few days! I would hate to put them through that. However, this group of 10, and going back there to experience the unfinished trail to Kongde, I think it will motivate and excite me enough to overcome the mental hurdles. What we would do differently – try to travel even more lightly, carry some emergency food with us, walk the way we are supposed to (a personal tip for me—slow steps reduce the strain), read some books and blogs on escaping earthquakes, and finally be better prepared for uncertainties and eventualities.